Become a debugging and web performance guru with the ultimate in-browser HTTP sniffer. Debug the network traffic generated by a web page directly in the browser without having to switch to a separate tool. Accurately measure the network performance of a web page and view opportunities for boosting its speed. No extra configuration or proxies are required - even with encrypted HTTPS traffic! Quickly find weak SSL configurations and other security related issues on your web server. Anyone can use the free Basic Edition to send you full log files to help you remotely diagnose errors or performance issues. 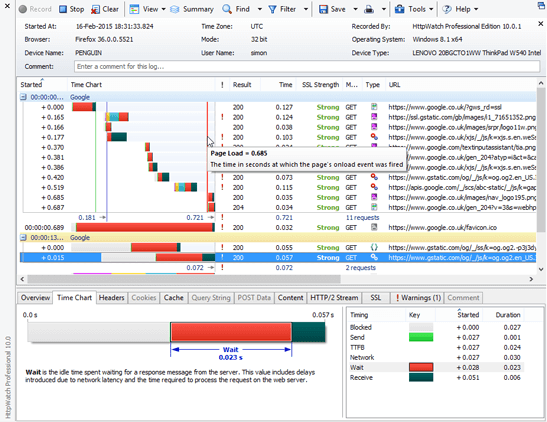 Use the HttpWatch API to collect performance data from your automated web site tests. We use HttpWatch to help ensure the performance of our site meets and exceeds the high standards of our community. HttpWatch is clearly the best I’ve used and has quickly become the tool of choice for my team. Thank you very much for HttpWatch! It is the best tool available to learn and understand HTTP and to see what the browser is doing. HttpWatch is awesome! We use it in QA while testing web applications. It allows us to quickly identify issues on the fly. After three days using HttpWatch Professional, I have cured more ills in my projects than in a month of effort using lesser tools. I love this product! It is the most useful tool I have ever seen for this sort of job. Well done! John Page - Javeo Corp.